Farr led the A-Main early and looked to be able to shutout the USC NSW points victory but Veal did Walsh a huge favour and took the lead spot from the ECP #7 just short of the half way mark. A critical pass for Walsh saw the Rocket #92 move into second place before the resilient Farr returned serve in an equally critical move to take back the runner up position. Realising the urgency Walsh then moved back past the ECP #7 as the pair battled closely but fairly for the honour of USC NSW Champion. Veal was unstoppable in the SWI Engineering Maxim and even a restart with two laps remaining was not enough to change the top three finishing order. Current Australian Champion Andrew Scheuerle was thrilled to finish fourth in his first run at Valvoline Raceway in two seasons with Sydney young gun Mick Saller recording one of his best results at VR for fifth. Matt Dumesny placed sixth ahead of Jackson Delamont in seventh, Danny Reidy eighth, Ben Atkinson ninth and James Thompson tenth. Sydney Speedcar veteran Darren Jenkins ‘scored one for the big kids’ tonight in taking out the final CEJN Australia main event before the upcoming international battles between the Aussies and the Kiwis on April 27-May 3/4. Jenkins took his beloved mat black #3 Mopar to victory lane ahead of the ‘two Matt’s –Smith and Jackson in second and third respectively. 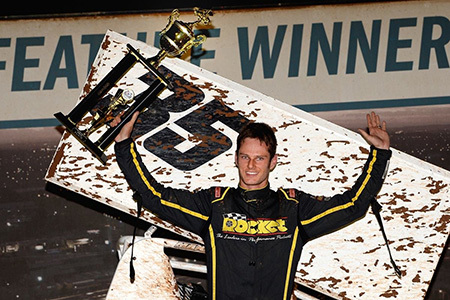 In a cracking 32-car field DJ emerged on top ending an A-Main drought and now taking him into the Kiwis v Aussies battle with some renewed confidence and plenty of speed. South Aussie Robert Heard and Queenslander Troy Ware were two interstaters who split the NSW top-ten with sixth and seventh respectively. Sydney Late Model veteran Darryl Grimson was a jubilant victor in the final A-Main before the $25,000 Easternapolis on May 4. “The Grim” took the chocolates over David Doherty in second place and Michael Hickey placing third. Lachlan Onley came home fourth ahead of Robert Carrig in fifth, Bruce Mackenzie sixth, Ed Borg seventh, Warren White Jr eighth, Blake Lutiger ninth and Nathan Disney rounding out the top ten.